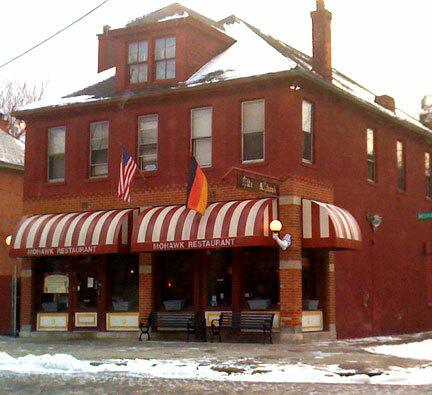 Many moons ago I lived in a magical land called German Village. OK, actually its a suburb of Columbus, Ohio, and reportedly also the largest privately funded restoration project in the country, but to me it is utterly magical - and I am transported to a bygone era each time I return. 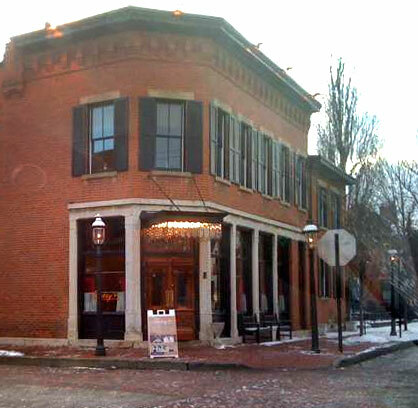 Strolling along streets of brick and cobblestone, there is an old-world look and feel to the warren of charming little shops and avenues that belies its proximity to downtown Columbus. Festive, unique restaurants abound, and a sense of neighborhood exists there that is sorely lacking in many other places I've lived. 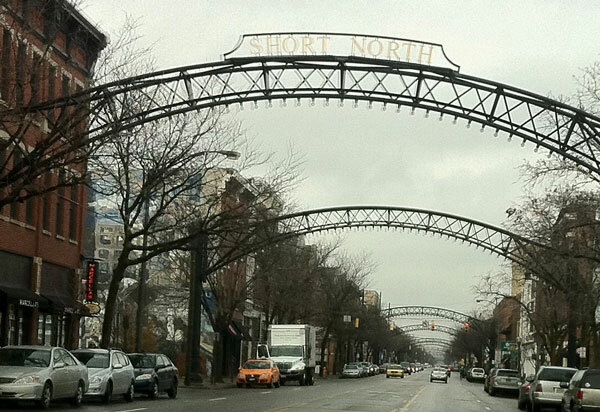 Last month I returned to my old stomping grounds, and spent a day immersing myself in German Village, Victorian Village, and Short North areas of Columbus - quite literally looking up my old address. 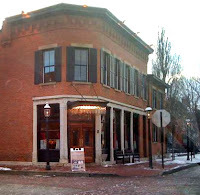 I love my home near the Atlantic, but there are times when I would very much love to be back in German Village, in my cute little cottage on Beck Alley, sipping a glass of wine and getting ready to meet my friends for a bite at one of our favorite places. Back then it was Tony's for pasta, Lindey's for brunch, Old Mohawk for a chicken salad quesadilla. The old-school Clarmont was our go-to for good steaks in a retro-kitsch setting, Max and Erma's (the original) for juicy big burgers and cheesy french onion soup, and of course Schmidt's Sausage Haus - for the incomparable spicy delicious Bahama Mama, tangy warm German potato salad, red cabbage, and creme-puffs as big as your head! On this occasion, I was in search of a little shop I'd read about on Urbanspoon. 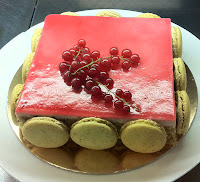 My mission - to procure some lovely macarons for a New Years Eve celebration at the home of my dear friend Kiki. 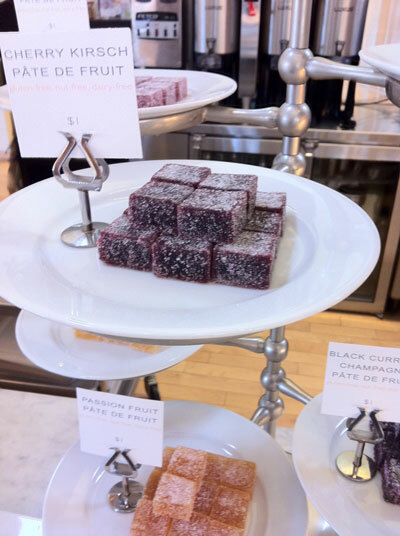 Pistacia Vera is a self-described "dessert boutique" - and the description fits the atmosphere nicely. Siblings Spencer Budros and Anne Fletcher's team whips up world-class dessert and pastry offerings in a charming, sunny space on German Village's 3rd Street. There are enormous, flaky fresh-baked croissants ($2.50 for classic all-butter, $3.50 for pain-au-chocolat) like you've never tasted (outside Paris) and locally sourced jellies to slather on them. 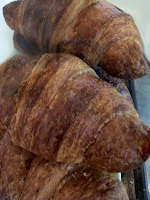 I stashed a couple of croissants away for our breakfast the next morning, and I'm still dreaming of them today. They are famous for their world class macarons, and just one taste confirms why. But who could have just one? Not I, said the cat. 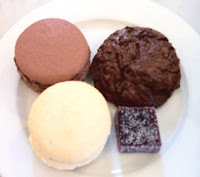 I managed to scarf down two - coconut and chocolate (a STEAL at $1.25 each) a chocolate fudgie meringue cookie AND a cherry Kirsch pate de fruit ($1 each). I tucked an assortment of macarons into a bag for our party. They were a big hit. Snapping pics left and right, I felt like a tourist for the first time on this culinary journey. It was as if I were in the Tiffanys of patisseries, only the prices were surprisingly affordable for these edible gems! Open daily from 7am to 7pm, they cater to the lucky few who can wrestle a seat in the small dining area. The rest of us are content to hover near the window or the coffee service area and wait for a seat to open, or take our haul to go, in a swank shopping bag. 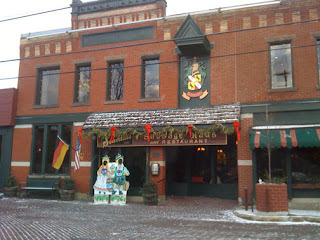 If you can't make it to German Village, they'll ship to you! Check out their website for details, and a delicious feast for the eyes as well. Pistacia Vera prides themselves on their attention to detail, their classic European techniques and recipes, and their ability to create their own style of unique, edible art - at affordable prices. 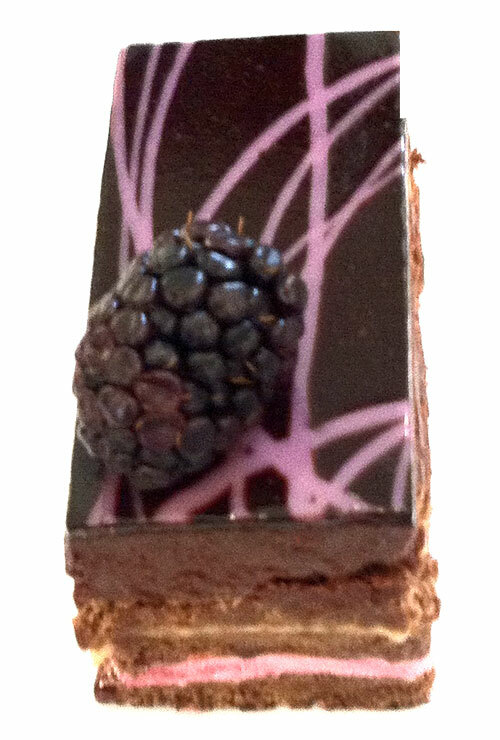 The Passion Fruit Chambord Truffle (mini $6/ small $24/ large $39) features gluten & nut-free layers of chocolate flourless cake, passion fruit curd & black raspberry buttercream topped with premium Valrhona Araguani (72%) chocolate mousse and chambord chocolate glaze. And since it's only eight months until my birthday, and eleven months until Christmas, should you be searching for the perfect gift for your favorite blogger.... but then, why wait for the big-name holidays, really? One could celebrate, say, Groundhogs day, for that matter. Hey - that's coming up next week, isn't it? 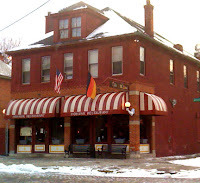 Next stop on the Midwestern Global Cuisine tour - Barcelona - also conveniently located in German Village! See, MAGIC! What does "home" taste like to you? Is it your grandmother's traditional holiday cake, the weekday casserole you wolfed down in record time so you wouldn't be late to rehearsal? Spiced peaches - straight from the jar, served in a pressed glass dish, because they remind you of a dear departed one? Whatever our prowess in the kitchen today, in our hearts we keep the recipes for those simple moments long since past, when our lives were orderly and somewhat carefree. A taste of home. Maybe that's what my parents had in mind in 1969, when they moved us from the shores of Long Beach, California to a slower paced life in Lancaster, Ohio. We settled in to our new home and began to adapt to its unique tastes and traditions. Farewell to real Mexican or Chinese food, hello to German and Dutch food. Chile was now "chilli con carne," soupy, with beans, and strangely sweet. Bell peppers were called "mangoes" in the store - before many Ohioans had the opportunity to taste actual "fruit mangoes." Farms, roadside stands and backyard gardens yielded fresh tomatoes, zucchini and "row-sneers" (roasting ears) of sweet corn. Our Ohio family had their own food traditions. Aunt Rose Ann brought five bean salad to our family gatherings. I love my aunt, but I always felt that was four beans too many. My grandmother (on my dad's side) introduced us to home-made whoopie pies, and she even made a chocolate cake with sauerkraut. My new friends came over for tacos, enchiladas, ribs on the grill and my grandmother's side-of-the-box recipe for macaroni salad with black olives. 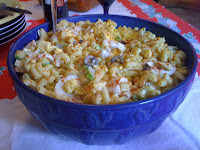 At their homes I sampled a whole new world of culinary delights. Pasta was baked with ground beef and tomato sauce, topped with cheddar cheese and called "Johnny Marzetti" after a relative of a Columbus restaurant chef from decades earlier. Home-made noodles or dumplings simmered slowly on the stove with chicken for a stick-to-your-ribs comforting dish. Tuna met its mac, and life was good. My Swiss mother-in-law made the best scalloped potatoes ever, and shared her recipe for a broccoli-cheese casserole that I crave to this day. 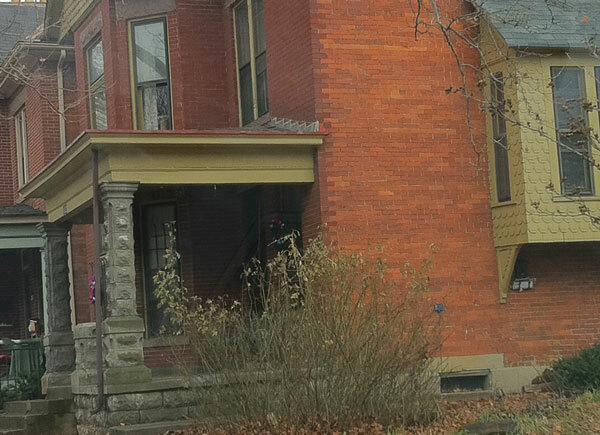 Neil Ave. in Victorian Village. Despite a friend's warning that the big city was crime-ridden and hamburgers cost five dollars for heaven's sake, my young husband and I moved to Columbus. I can trace much of my passion for learning about food back to that move. I loved combing my new surroundings for their culinary treasure. 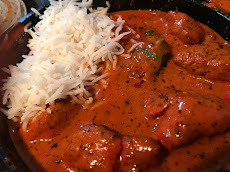 With weekly forays to specialty markets and ethnic restaurants, sampling an array of foods that had never graced our table while I was growing up, I was in culinary heaven. Each subsequent move to another city solidified my passion for seeking out the best local foods and ethnic specialties. 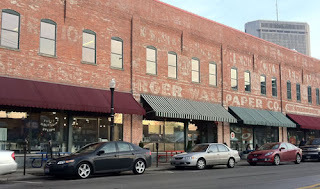 So on my most recent visit I spent a day cruising around my old "hometown" - stopping in to visit some classic faves and mapping a trail of new discoveries via Urbanspoon. First stop, the venerable North Market - Columbus’ only public market, home to dozens of unique, independent merchants and farmers, a grand central food destination that has grown gracefully into its location in a turn-of-the-century farm implements warehouse. During the growing season they host a farmer's market on Saturdays. Year-round the market is a great place to sample a wide variety of locally grown, locally made foods, shop for cookware and accessories, and share a meal with friends. 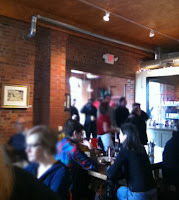 If I lived in Columbus, breakfast and shopping at the market would be my Saturday morning ritual. Since I was just in the neighborhood for the day and had lots of ground to travel, I settled for a self-guided tour and some strategic snacking. 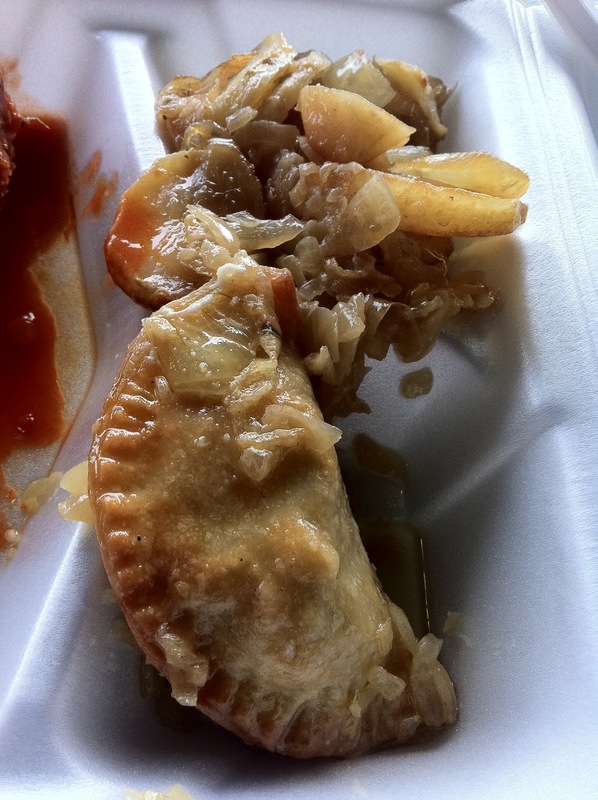 One standout was this savory pierogi from Hubert's Polish Kitchen. The gregarious Hubert Wilamowski talked me through the trays of scratch-made Golabki, kotlets, sausages, and sauces, and his passion for his craft was evident. It took all the willpower I could summon not to order one of everything. This little cheese, potato and onion filled gem, glistening with melted butter, reminded me that there are whole cuisines I have yet to fully explore. 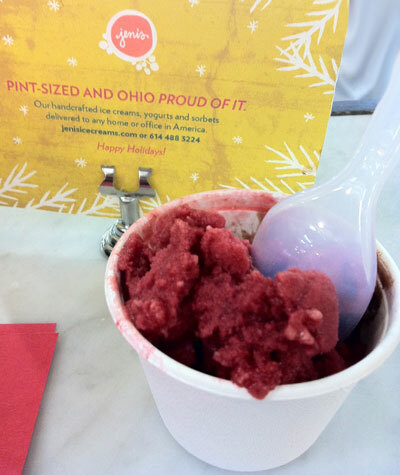 A treat from Jeni's Splendid Ice Creams was a must - despite the winter's chill. I enjoyed tasting my way through their artisan ice creams and sorbets, but I settled on two favorites - Queen City Cayenne, a rich chocolate ice cream with a sweet spicy hit, and the lovely, rich Cherry Lambic Sorbet - tangy, tart cherries blended with sweet, crisp cherry lambic beer. Together they reminded me of an over-the-top Black Forest ice cream cake. I loved it so much I snapped up a few gift certificates to treat my local friends and family to their own cones. The North Market is where Jeni got her start - Jeni Britton Bauer and husband Charly Bauer co-founded the company in 2002. Together with their small team, they make every batch of ice cream that is served in their stores in Columbus or shipped to doorsteps nationwide. 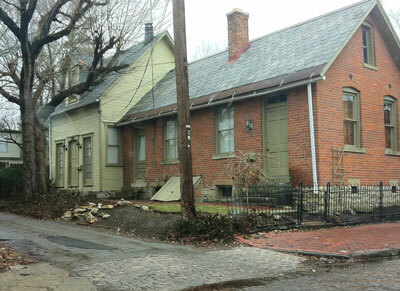 I navigated Charlotte the Prius to my next destination - a block off the beaten path in Pearl Alley. TASI Café is a friendly, casual spot featuring seasonal, all natural, healthy food. Its just the kind of place I wish were in my neighborhood. A spin-off of sorts to one of the area's flagship restaurants (Rigsby's Cuisine Volatile), the cozy urban-chic TASI suits the Short North perfectly. TASI serves breakfast all day, but also dishes up lunch and dinner, with dine-in and carry-out options. Prices are super-affordable. 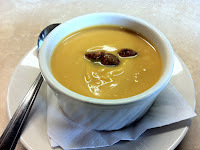 There are only five parking spots, so it took a couple trips around the block before rock-star status was achieved, but once inside, a warm bowl of the soup du jour was my reward - a perfectly seasoned butternut squash puree accented with smokey-sweet roasted marcona almonds. 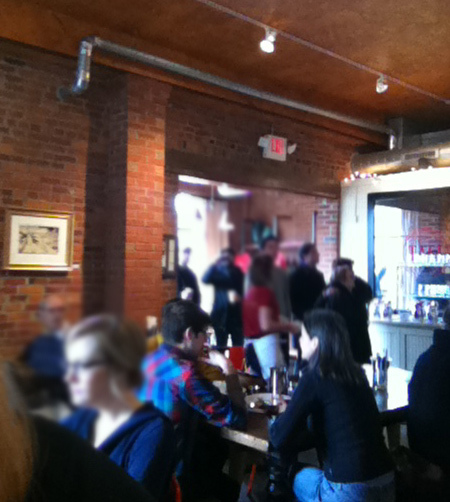 If and when I'm back in Columbus I hope to sample more of their menu. Next stop on the "My Ohio" culinary road trip - German Village.